Is disease bad? What are we all afraid of? What if there is really a beneficial purpose to acute disease? Part of that purpose is to educate the immune system! What if in the suffering of childhood diseases there is the possibility of liberating the system from inherited encumbrances? What we know is that the development of a fever when a child is sick equals a cleansing process. Metabolism is increased, toxins are cleared from the system, and we see developmental leaps after an acute illness resolves. Acute disease is called into the system to stimulate this process The immune system is being exercised and maturing in this natural and amazing process! The problem is that, in some cases, the dose of acute disease may be too strong. What then? The question is how can we support the natural process of disease but not let this process be too violent? Facilitating this process safely is the goal of homeoprophylaxis. The real goal is not to avoid disease but to capture the benefits without the suffering. The size of the dose of disease is critical in accomplishing this. Nosodes emit the same frequency as the original disease agent. This frequency acts to stimulate general immune system function. Taking a dose is like taking a tiny dose of the disease itself. Because the nosode is energetic there is no actual disease present, however when introduced to the body, the body behaves as if it has the disease for a moment. This process is sufficient to educate the immune system about that particular disease. This is a similar principle that vaccines were historically based upon. But……nosodes are made without additives, adjuvants (chemicals added to increase the action of vaccines) or preservatives! These days vaccines have been used as an attempt to avoid disease at all costs. However with increased chronic disease and disruptions in normal childhood development people are now questioning the costs of conventional vaccines. With homeoprophylaxis your child can receive the benefit of catching the disease without any of the risks or suffering! THIS is true education of the immune system. “Homeoprophylaxis: A Vaccine Alternative” can now be heard right in your own home! Cilla and Kate’s popular 2.5 hour public lecture has been well received in Europe, Canada and throughout the U.S. by parents, students and health practitioners. Learn about how the immune system develops and how HP supports healthy maturation. Click on http://http://freeandhealthychildren.com/a-parents-lecture-on-homeoprophylaxis/ to learn more. Did you know that homeopathy can not only treat influenza but can also be used to prevent it? While the conventional model would have us think the Influenza vaccine and Tamiflu are the only options when it comes to treating or preventing the flu, homeopathy offers another way. If you are armed with a home remedy kit, or even have access to a homeopath you can be sure you will make it healthily through this flu season. At the time aspirin was the conventional medical approach to treatment. Unfortunately aspirin dosing leads to pneumonia which then can lead to death. As aspirin also promotes bleeding and the conventional use called for excessive dosing, many people who took aspirin also died from hemorrhage to the lung, or internal bleeding. Influenza is easy to treat with homeopathy. We have the understanding that the remedy that best matches the symptoms of most of the presenting cases is called the “Genus Epidemicus.” Sometimes a group of remedies will be effective as the Genus Epidemicus. In the epidemic of 1918, the primary Genus Epidemicus was Gelsemium. Other remedies like Rhus toxicodendron, Bryonia, Eupatorium perfoliatum, Baptisia, and Pyrogenium (in that order) were also used with success. These remedies are all still commonly used in the treatment of the flu and prophylactically. The first remedy to think of for prevention would be the homeopathic nosode Influenzinum. This remedy is available through your local homeopath. What follows is a brief listing of the most common homeopathic remedies for flu. When in doubt consult your homeopath. Baptisia: Looks drowsy and drunk. Flu with high fever, delirium and a feeling of being bruised all over or disintegrating. Bryonia: Extremely irritable, talks about business. Flu with a severe, throbbing headache, body pains. All symptoms are worse from any motion. Eupatorium perfoliatum: Flu with body pains so severe, that the bones feel broken. Gelsemium: Flu with chills up and down the spine. Must lay down, cannot stand up, and paralytic weakness. Phosphorus: The flu quickly affects the lungs, especially the base of the right lung. Lots of cough, and possible bruising or bleeding. Pyrogenium: Septic states where flu has turned to decomposition. Foul smelling breath. Low fevers and delirium with rapid pulse. Rhus toxicodendron: Flu with body aches, stiff and restless, better with movement hot bath and massage. [i] Winston Julian. UThe Faces of HomeopathyU. Tawa, New Zealand: Great Auk Publishing, 2004. Why is there a Polio epidemic in Syria? Pathogens have acted as checks and balances in the human population based upon human frailties and errors of living. The action of pathogens can be seen as pressure release valves for situations and environments not conducive to sustaining human life in its fullest, either for the individual or the larger population. Those with poor nutrition, living in over-crowded or unsanitary conditions, or those under certain political and social pressures have a much greater susceptibility to contracting a disease which specifically relates to those conditions. The disease serves as a catalyst to solve the problem of the inhospitable living conditions. Humans must act on the changes that need to be made within that population to lessen the incidence of the disease. Most of these changes have to do with hygiene and nutritional status, but the political-social-economic forces must also be dealt with and changed. Ever wonder how it was that after the earthquake in Haiti cholera set in, yet in the Dominican Republic, which shares the same island there was no cholera? Moreover, as Haiti is on an island, where would cholera come from and why would it show up, then and there, after the earthquake? History demonstrates that cholera comes into a population when there is a destruction of the central government and the sewage and water are mixed. These two ingredients together leave the population susceptible to this kind of disease. It is not until a central governmental body was established and the water was cleaned up that the epidemic was brought under control. The same could be said about Syria and Polio. The last polio epidemic we knew of took place in the 1950’s here in the US. 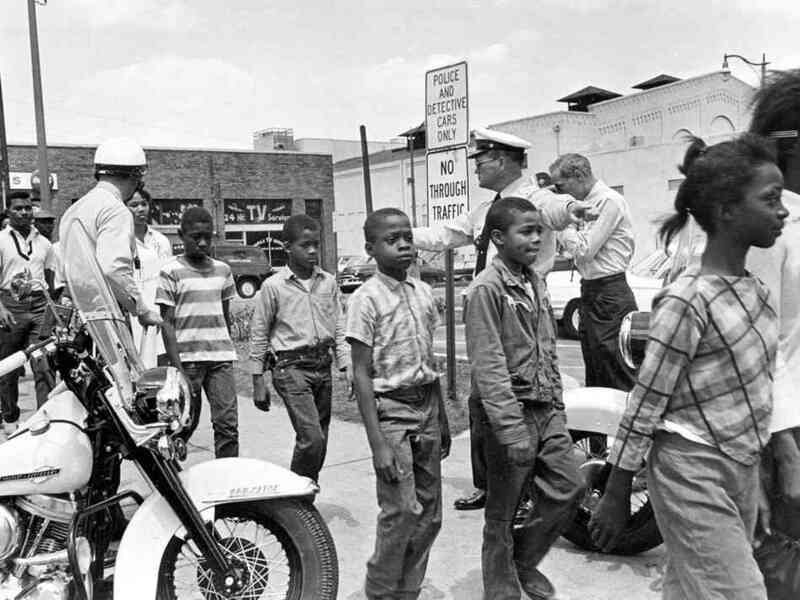 During that time there was huge social unrest based on the ever present racial divide. It was when one group of people forced dominance over another group, so much so that the dominated were subjected to torture and discrimination then Polio found itself a home. When social conflict cannot find a rational vent towards resolution, an epidemic disease of similar construct sets in to attempt to solve the problem. So now in Syria, one group of people is seeking to dominate another and no amount of rational debate or international support is achieving a solution. The morphogenetic field of the people of Syria is crying out for resolution and nature has produced a polio epidemic to help solve the problem. Based on this understanding of disease I doubt that any amount of vaccination will help solve the problem until the social unrest is alleviated. It is to these ends that international aid be focused if we want to see a reduction in disease incidence. Under Who’s Authority is My Body? Our immune system is the central governance of our body. Its purpose and innate prerogative is to differentiate self from non-self: To determine what is good for the body and what is not. This plays out in the face of infectious disease, the food we eat, and the thoughts we think. In health, those things our body determines are good for us are absorbed and integrated into its internal makeup. Those which are not are eliminated. The immune system eliminates that which is not us via fever, discharge and eruption. The digestive track eliminates toxins via vomiting and diarrhea. Our brains eliminate what is not true for us via disagreement and by knowing who we really are. This self-governance is an inborn mechanism that comes hand in hand with our birth-right and humanness. When it comes to disease prevention does it not make sense that we are free to employ this innate prerogative for our self-preservation? In a diseased state our central self-governance fails to discriminate self from non-self. It fails to eliminate toxins, to respond appropriately to infectious agents and can no longer determine what is true or false for us. Today where 1 in 50 children have Autism, which is determined to be a failure of the auto-regulatory system, one must wonder how it got this way. 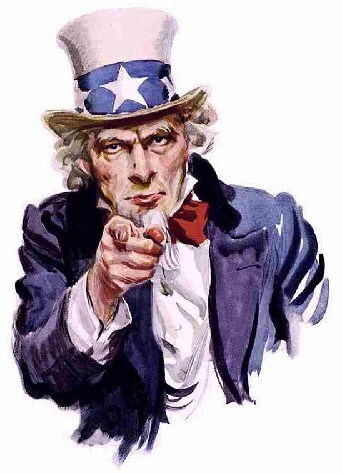 When our government dictates that we are to inject our children and ourselves with multiple disease agents, in a concoction that is designed to falsely manipulate the immune system into functions it would not ordinarily do, we have lost control of our auto-regulatory system, and ultimately lost authority over our self-determination. Our children, who we never asked, never had the opportunity to make that choice. If we are to live in a free and just society we must have the right to govern what goes in our bodies. We must have the right to reign over our flesh and blood. We at Free and Healthy Children International believe that homeoprophylaxis offers another way of disease prevention. It is a way that respects how the immune system is designed to work and ultimately serves to strengthen and educate the immune system so that is can continue to do what it is designed to do; differentiate self from non-self and keep us healthy and self -determined. Why Not Just Do Nothing? We meet parents all the time who are bright, intelligent, and resourceful. They care deeply about their children. They’ve done their homework investigating the ingredients in vaccines, and they question the risks to premature babies, immune compromised children and other atypical populations. As a result of their investigation, they’ve made a choice to not vaccinate and we applaud them! So why undertake homeoprophylaxis (HP) instead of just doing nothing? 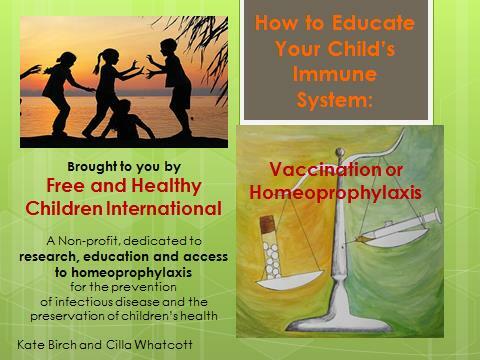 Simple: To educate your child’s immune system. The act of coming in contact with a highly attenuated (weakened) natural disease carries great benefits. 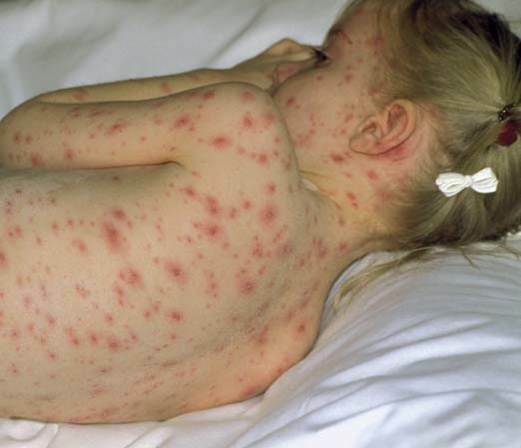 Mother Nature had a plan when measles, mumps and chicken pox were designed. Their purpose is to exercise and educate a child’s immune system. This biological education includes mounting a fever, creating a discharge or eruption and finding resolution – the steps for the maturation of full immunity. Our good health is dependent upon our harmonious relationship with viruses and bacteria. These life forms possess a directive to live and thrive, mutating if necessary. Rather than being a sitting duck and waiting around to see if you get sick why not per-emtively educate the immune system towards the disease process? HP delivers one disease at a time in a pure and gentle manner. It’s introduced through the mouth where the initial immune response can begin. this in turn enhances immunity. Enhanced general immunity is added insurance for long term health. There are no preservatives, no antibiotics, no chemicals of any kind; just the vibrational pattern of the disease itself. HP provides all the benefits of disease without any of the risks.